Home > Information > Contact & Find Us! Based on the Springwood Industrial Estate, just over a mile from the A120, Novadata is about 20 minutes from the M11 and the A12. Exit the A120 and follow the signs for the Springwood Industrial Estate. Follow the main road on the estate (Springwood Drive) for about ½-mile and turn left on to Tamdown Way then right on to Blackwell Drive. The parking spaces in the Novadata Car Park and Overflow car park are for cars ONLY. Vans and other large vehicles must be parked in the free truck stop just off Springwood Drive (indicated on the map on the reverse) which is just a few minutes' walk from Novadata's premises. Please use the parking spaces provided in both car parks. Parking on Blackwell Drive is not permitted where double-yellow lines are indicated. There is a clearly marked area for motorbikes. Motorbikes should not be parked in car spaces. 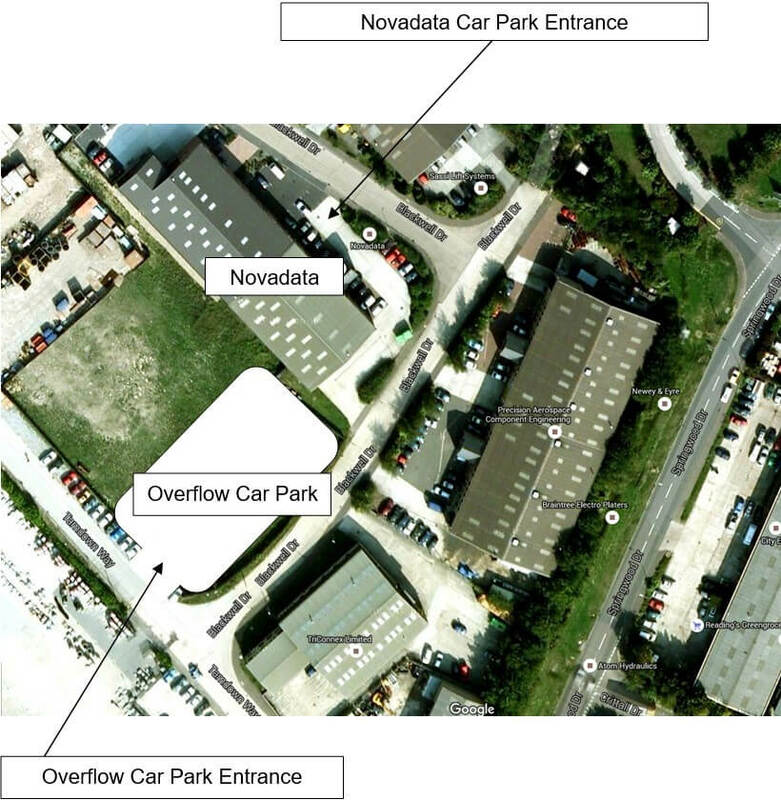 In the event that the Novadata car park is full, there is an overflow car park to the rear of the building (the entrance is marked below and is height-restricted). In the event that this overflow car park is full, there is a large (free) public car park, which is just a few minutes' walk from Novadata's premises.